Now The Details: Did the Media Get the Israel-Hamas War Right? Did the Media Get the Israel-Hamas War Right? Not very well, according to a former AP Jerusalem correspondent Matti Friedman. In his blistering critique, Friedman claims that his own organization blew it. Big time. Friedman blasts his former employer the Associated Press news service for a variety of sins. These include, over-covering the story ("The agency had more than 40 staffers covering Israel and the Palestinian Territories...more news staff than the AP had in China, Russia or India, or in all of the 50 countries of sub-Saharan Africa combined..."). He questions his editors' editorial judgment: "The AP's editors believed, that is, that Syria's importance was less than one-40th that of Israel..."
"Every flaw in Israeli society is aggressively reported...I counted 27 separate articles, an average of a story every two days." "A story on Hamas intimidation...was shunted into deep freeze by...superiors and has not been published..."
"...A significant peace offer to the Palestinian Authority (in early 2009)...but the top editors at the bureau decided that they would not publish the story." These are damning accusations. So I asked the AP for a response. In a polite email from the AP's director of media relations, Paul Colford wrote "we'll refrain from commenting on the piece and the writer in question." The media's obsession with Israel tends to be exaggerated in many cases. And there is a media bias in general toward any group in the conflict that advocates for a peaceful outcome. But Friedman's essay evoked a couple of thoughts: one, the murder of James Foley has now I believe, shifted opinion in a significant way. More people are stating (quietly thus far) that the values of Hamas and the IS are not so different. 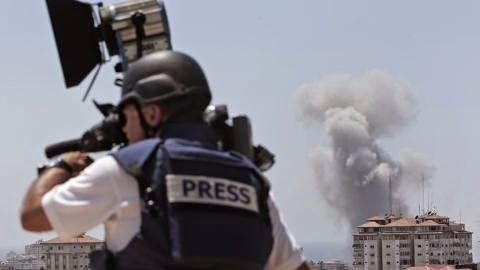 Criticism of the war on Gaza and of Israel's prosecution of the war, is declining, in part because the worst of the TV images have ended, but also because to do otherwise runs the risk of being lumped in with the IS barbarians. Two, aside from the appalling European anti-Semitism which one ignores or downplays at one's peril, there is a growing fatigue with the Israel story. There is a sense that the situation is truly hopeless and the parties are unable to settle this either militarily or otherwise. The next step seems to be an American imposed deadline for a settlement, followed by the imposition of an agreement. Finally, Friedman's observations are - to my way of thinking - very much from the shop floor. Decisions made by editors and managers (who often don't communicate very well) have a way of appearing to be thoughtless or deceitful. At their worst, they give an impression of being anti-journalistic at best and craven capitulation at worse. It sounds like Friedman did not do a lot of reporting on his bosses. He may not have asked them why they took the positions they did. That way, it's easier for beleaguered journalists to believe the worst of their bosses and the role of aggrieved-reporter-as-vicitim-of-management gets further petrified. My bias stems from years in the management trenches, with my motives and decisions often being second guessed by the reporters and editors. Explanations from the corner office can be dismissed as self-serving and unduly defensive. So while Friedman makes some interesting observations, it feels a bit short-sighted to me and plays just as effectively into the trope of mendacious media management as much as he wraps himself in the victim flag. I've known a few AP managers. It is an excellent and trustworthy news organization. Like all news orgs these days, I'm sure there are the usual assortment of characters - some more beleaguered than others, whose motivations may be less pure than Friedman's. But his unproven assumptions about those motivations feel like the musings of a disgruntled ex-employee thus reducing the value of an otherwise interesting column.